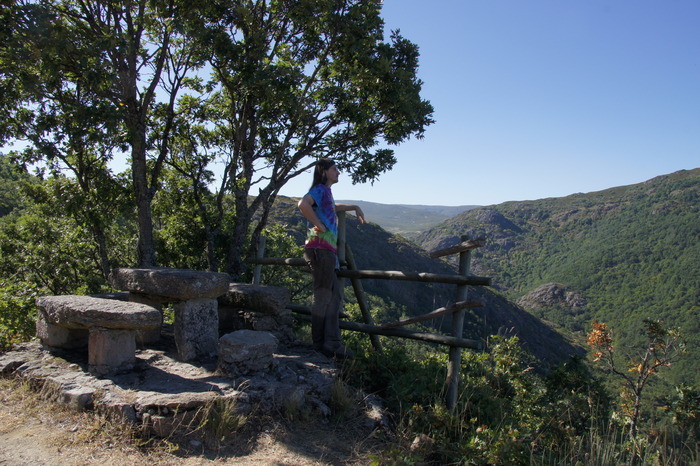 For the European half of our vacation this year, we visited Spain and Portugal, with the loose goal of finding the European International Rainbow gathering. We did find it, but there are no pictures - it's an experiential sort of thing, and lugging a camera around tends to get in the way. However, we took our time getting there and getting back, so there are plenty of pictures from both ends of the trip. 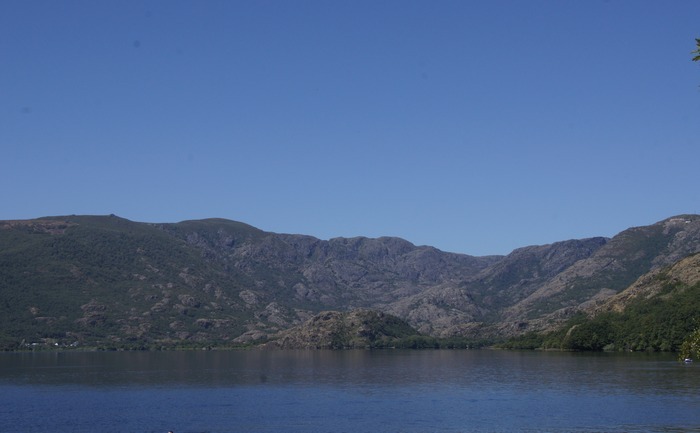 Our first stop along the way was the Lago de Sanabria, one of Spain's national parks. As you may have guessed, this is the eponymous lake. 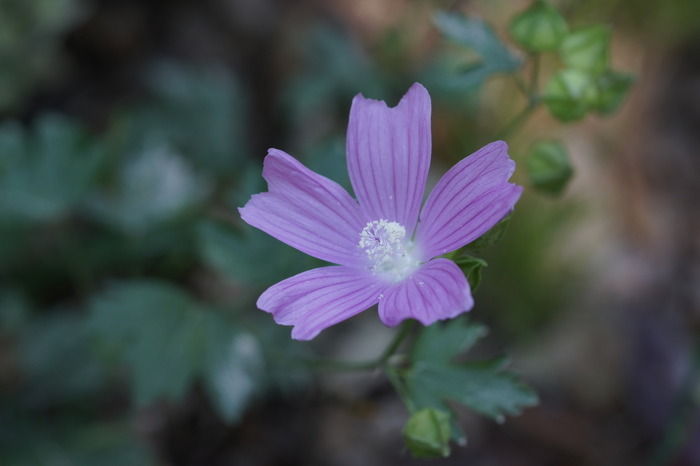 Although the geography looks a lot like Lake Crescent, and the flora looks a lot like Eastern Washington, there are many small reminders that you are not in Washington. 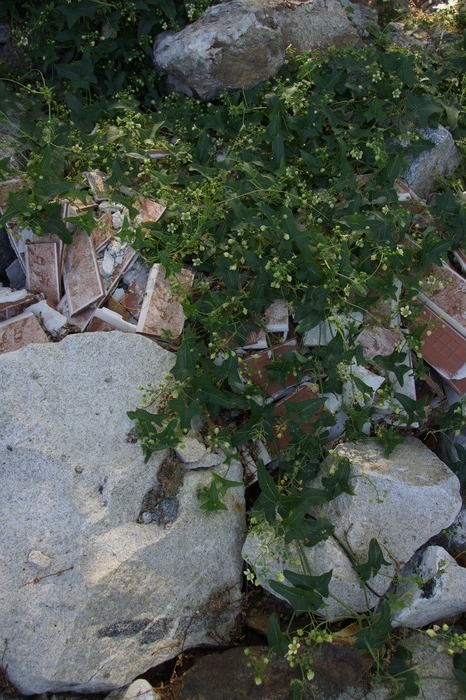 We found this pile of rubble, which turned out to be a ruin of a house overgrown with ivy... one with a tile floor, apparently. 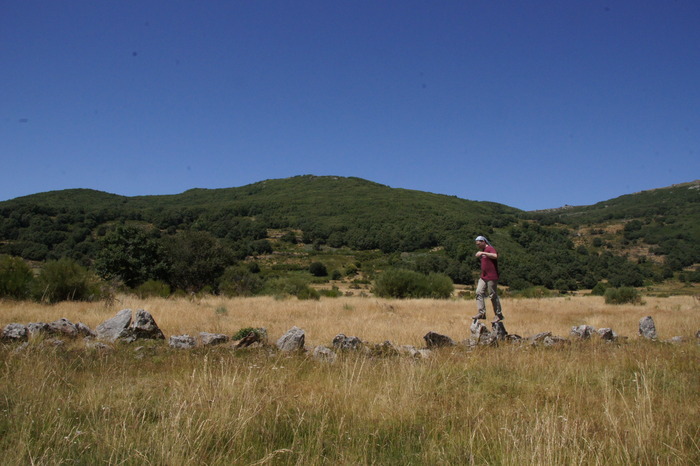 There's also these walls of stones all over the countryside (there are a couple in the background too, outlining the treeless patches in the middle of the photo). These might have been built to enclose livestock, or may have just been the result of piling up stones ploughed up from the fields. There are certainly plenty of stones left in the fields, though. 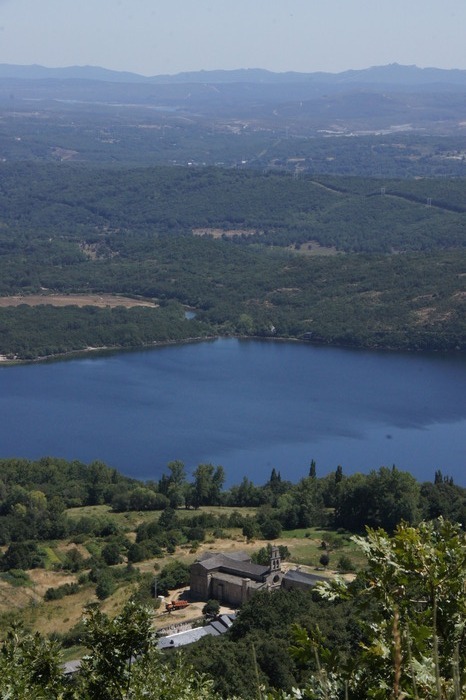 The Monastery San Martín de Castañeda overlooking Lake Sanabria. 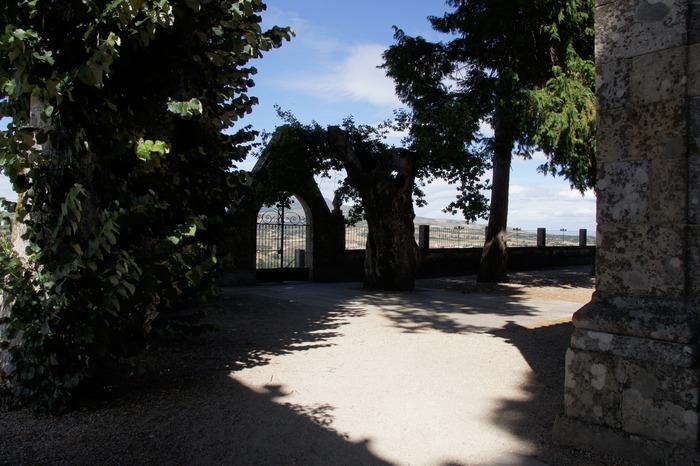 Parts of the monestary date to around 900 AD, although it was rebuilt in the 16th century. Local legend says that the lake was formed when a poor traveler came to town. No one would offer him food or shelter, except the women tending the ovens where bread was baking. They let him sleep by the ovens to keep warm, and when he woke they were surprised to find the bread had grown in the oven so there was plenty to eat. The traveler was Jesus in disguise, and he drove his staff into the ground, from which a fountain emerged which drowned the townsfolk who would not feed or shelter him, but spared the women with their oven as an island in the middle of the lake. 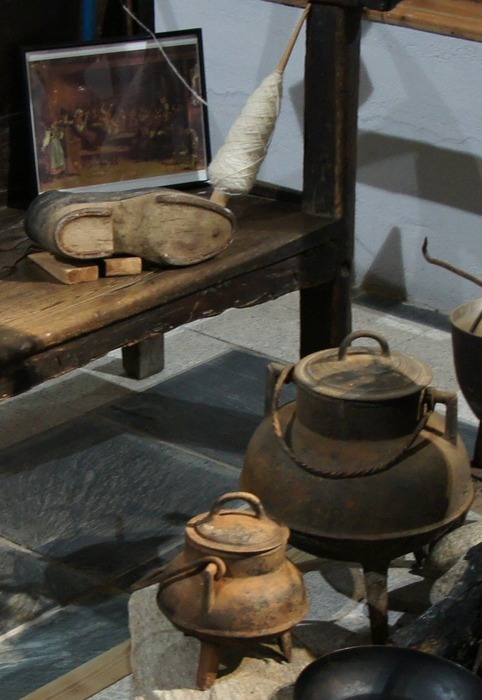 The monestary contained a small display on the daily life of the people of the region. Eric pointed out that this person-shoe looks a lot like horse shoes. 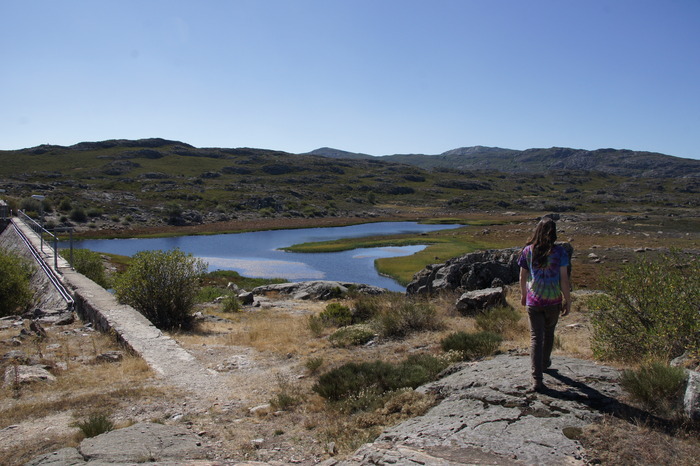 The road ends at the Laguna de los Pescos (Fish lake). The local shepherds were bringing their flock down for a drink. The herd was controlled with sheep dogs - but not any sort of collie that I could identify. These were leggy dogs with thin tails which half-curled into a J, with that mix of colors that tells you they are not breeding for color. 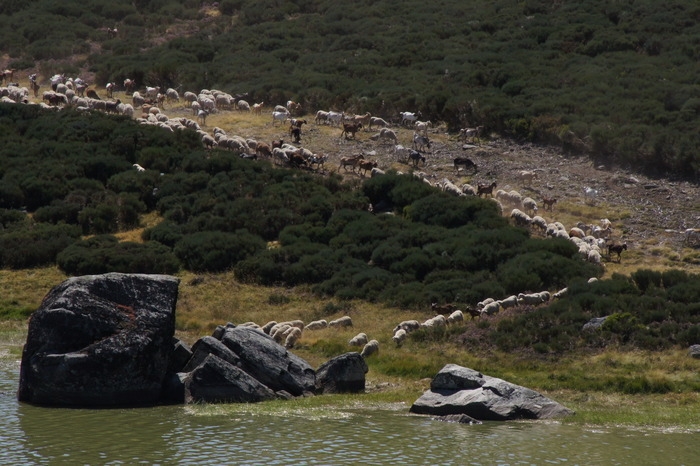 They did their job, though, with the clanking of bells on the goats and sheep echoing over the lake. Heather, and an as-yet-unidentified wildflower. 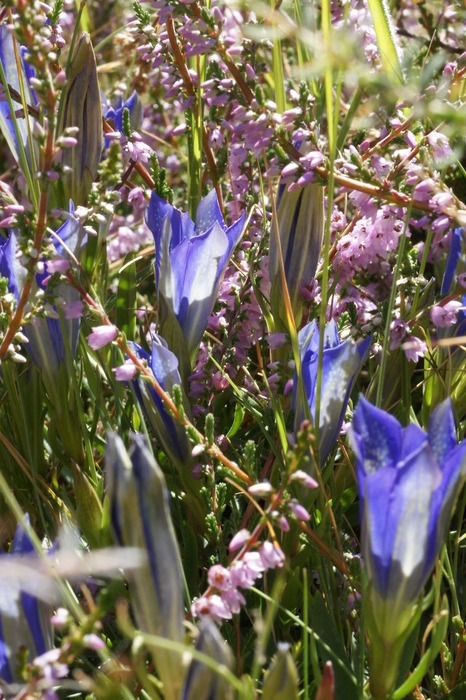 Both were blooming all over the mountains. 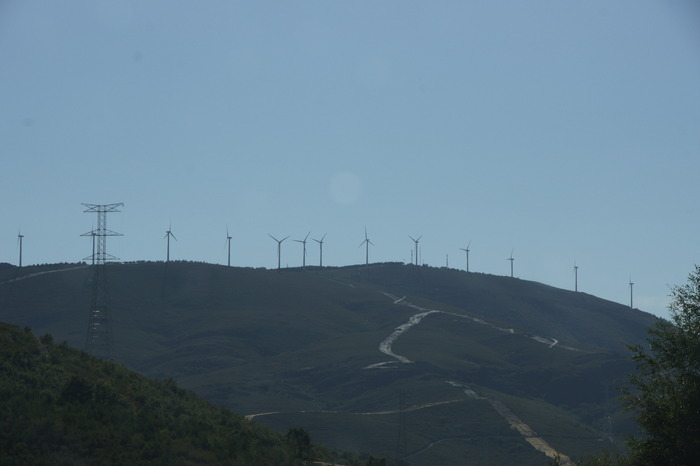 I was pleasantly surprised to see that the areas we were in (northern Portugal and the part of Spain that shares that border) had a lot of solar panels and windmills. In between this picture and the next was the Rainbow. The Rainbow is essentially a temporary commune that forms here and there, now and again, the location spread by word of mouth (and now by internet). I like it because it's an (albeit temporary) non-heirarchical society that actually works, not to mention an excuse to go camping for a week or two. I don't have photos, but I do have some mental postcards. The big gatherings are always called A Gathering of Tribes, but the different languages being spoken at different camps gave that impression much more than the national gatherings in the US. 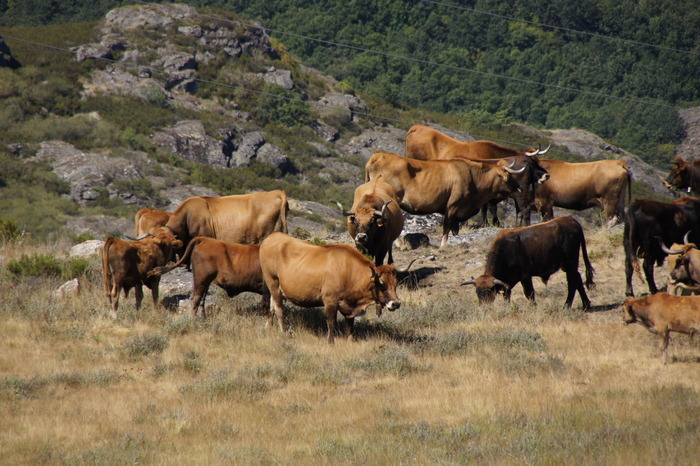 The gathering was held on grazing lands, so in addition to all the Rainbow Family in the woods there were a lot of cows. They had great long horns, but were fortunately quite friendly. They did learn to beg for food, though. Usually we carry water and chop vegetables, but this year our big contribution to the Family was dog rescue. Someone showed up with a dog with a broken leg, which they asked me to splint. I couldn't do much with it with the equipment at hand (sticks and elastic bandages only go so far) so we drove them into town to see the vet. When we got to town we asked a guy where to find the vet. He didn't speak much English but we waited while he got on the phone. We figured out that the vet didn't have an office, only made house calls, but the guy invited us (me, Eric, the injured dog, the dog's two owners, and their other dog) to wait on his patio while the vet came. He brought us some ice water to wait through the afternoon. The vet came, but said that it would need an xray, which could only be had in Chavez (another half-hour's drive away). So we drove to Chavez. The vet in Chavez looked much like the ones at home, with modern gear and the usual flea products and pet food. The important difference is he was able to do the surgery for about 1/3 of the price that it would cost in the Netherlands (or France, where dog and owner were from). So the dog was able to have his surgery for a price his owner could afford. When we got home, we got an email to let us know that everyone had made it back to France OK. How can I thank you? asked his owner. I told her, You can remember this when you have the chance to help someone. Someone at main circle one night had a couple of didgeridoos. One was modified to have a sliding piece like a trombone, so that he could change the length of the didg and therefore the pitch. The other guy was beatboxing into his didg. It sounded amazing, probably especially to the girl who was laying on the ground between the mouths of the two didges, one for each ear. Rainbow always has dinner at main circle, served by main kitchen. Usually that's held just before dark, but here it was just too hot to cook until dusk. There wasn't much of a way to tell who already had food and who didn't, so the servers took to shouting, Soup! First time! and so on, so they could tell where to go with the kettles of food. Our camp was on the mountain overlooking main circle, so one evening we walked back to camp to find a spectacular view of fire dancers in main circle. 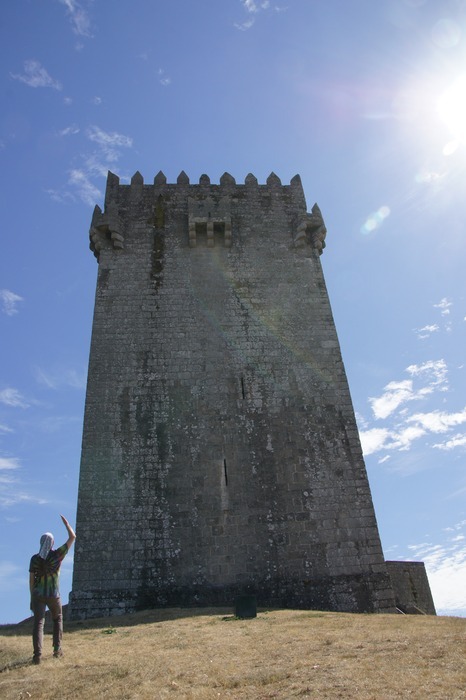 We happened across the Castle of Montalegre. There was probably some sort of structure on this site since Roman times, but the modern castle probably dates to some time around 1300. An inscription indicates that construction was completed in 1331. In the 1600's it was modernized to withstand artillery. In 1910 the site was declared a national monument. An odd feature of the castle was this big hole in the ground, inside the castle walls. Was it a dungeon? A well? Apparently it was a cistern, a structure for collecting rainwater. When it was in use it would probably have been indoors. 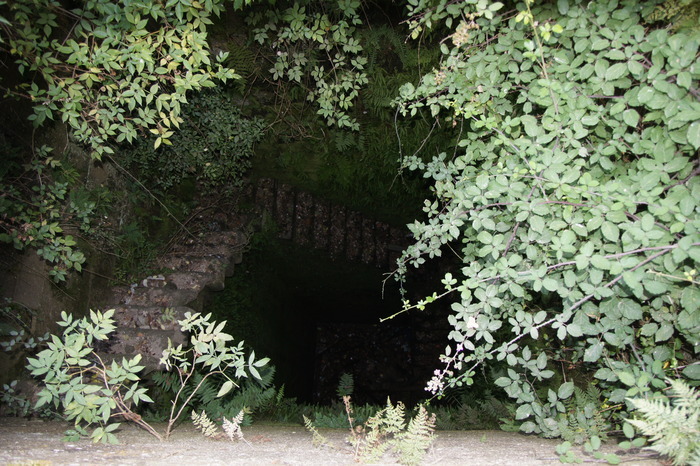 Some Portuguese cisterns are quite large and elaborate, like a man-made lake in a cave. It's hard to tell where this one goes - they did not allow visitors down the stairs. The churchyard across the way. Like most churches, this one has a graveyard. 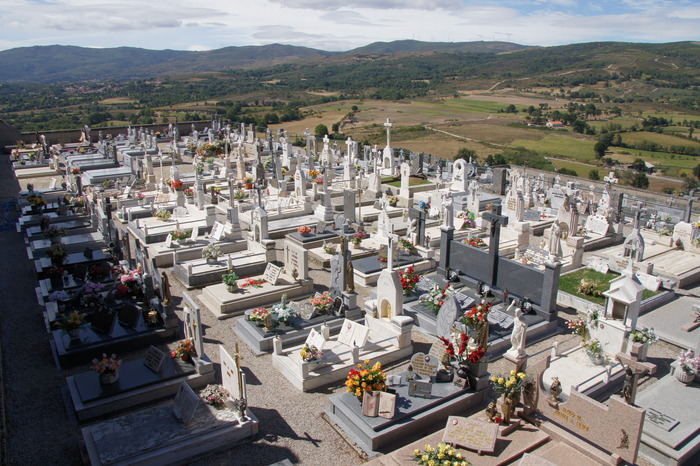 Nearly all the churches we found were perched on top of hills, and thus had a graveyard with a spectacular eternal view. This one is better than most, though. 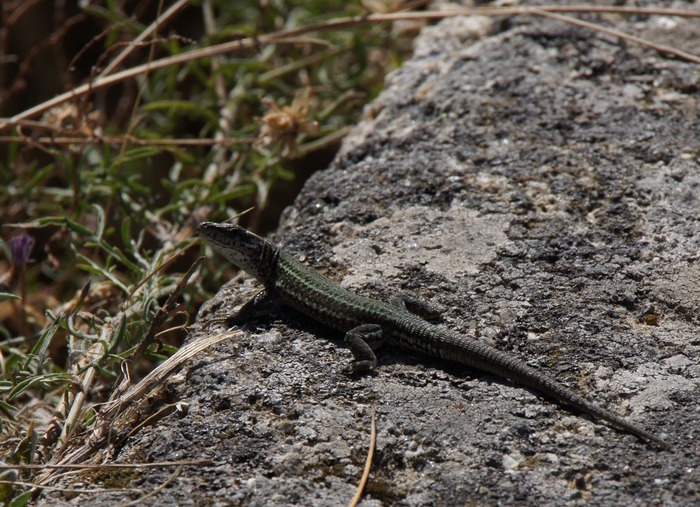 One feature of Spain and Portugal is that lizards seem to have stepped into the role that spiders occupy in our cold and damp climates. Lizards were everywhere, especially in the evenings, camoflauged against the green and grey stone and darting out of the way just in time to avoid being stepped on. 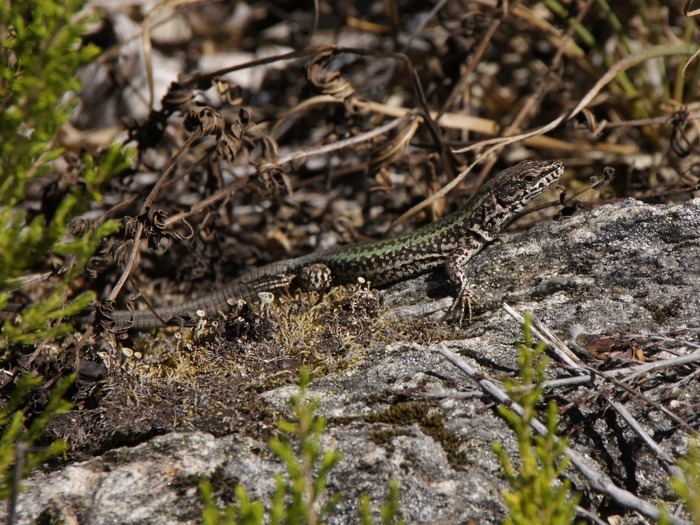 Probably all the ones we photographed are varieties of wall lizard, a family of a couple hundred similar-looking lizard species adapted to various habitats (forests, deserts, trees, etc. and, presumably, walls). One species even eats seeds, a very odd habit for a lizard. The colors vary both between species and within species, so there's no good way to tell which one we have here. It was sitting on a wall, though. 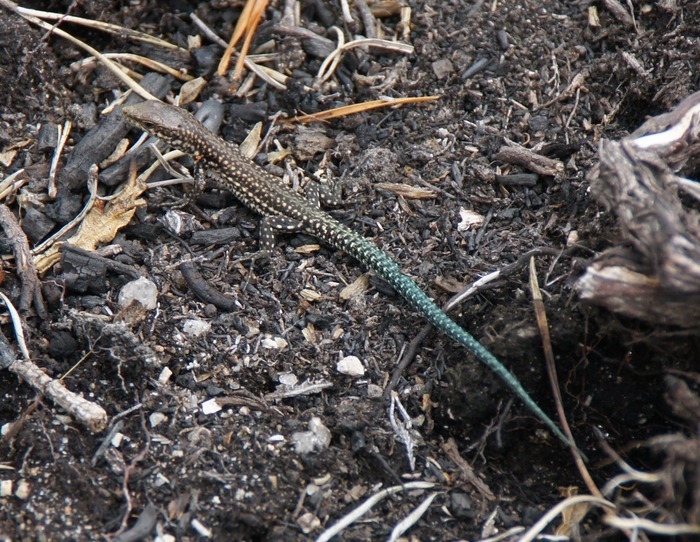 A green-tailed lizard. This one was not on a wall, but instead darting between the rocks at the site of a former forest fire (note the charcoal around it). Clouds coming in over the valley. 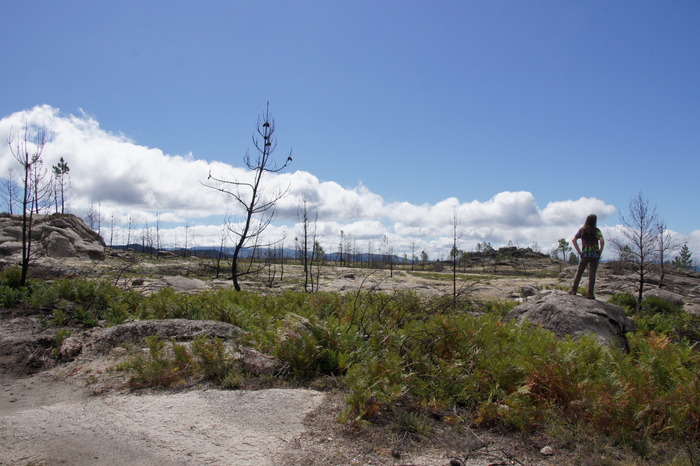 Much of the area we drove through had suffered a burn in the last ten years. I would guess this one was a couple of years ago, given the size of the ferns and scrub creeping in. 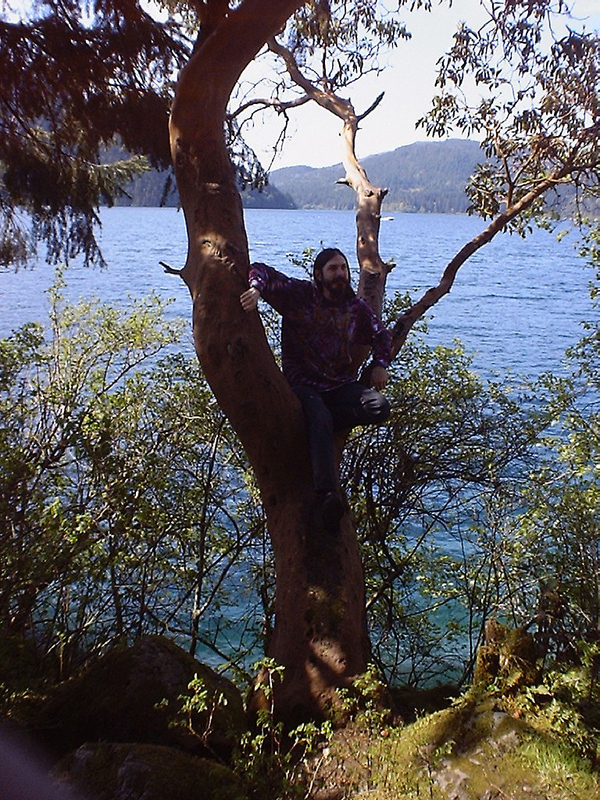 Eric standing on a spot which resembles the head of a uintatherium, and probably about as precarious. This is the same site as the previous photo, but the trees were protected from the fire by the hill. 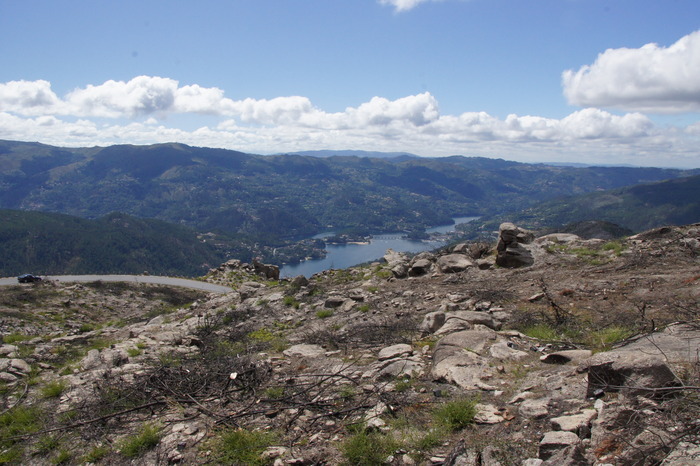 Driving into a town (I think Admeus) out of the Parque Natural da Peneda Gerês. 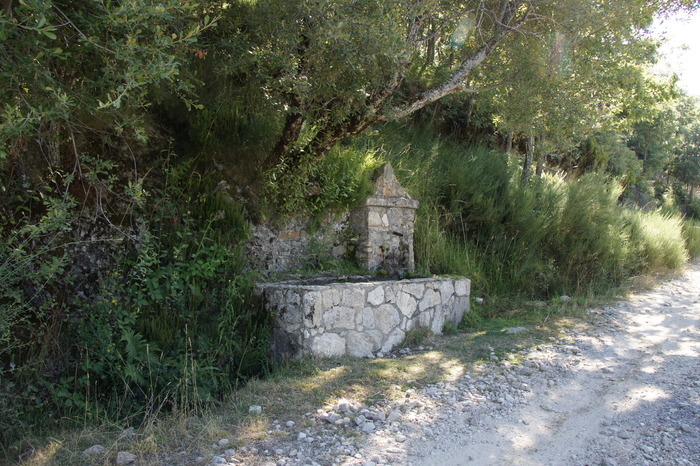 There are many cool things in the park including a bunch of natural springs which have been made into small fountains (more like an eternal sink than the kind that spray water everywhere), and the Rio Caldo. 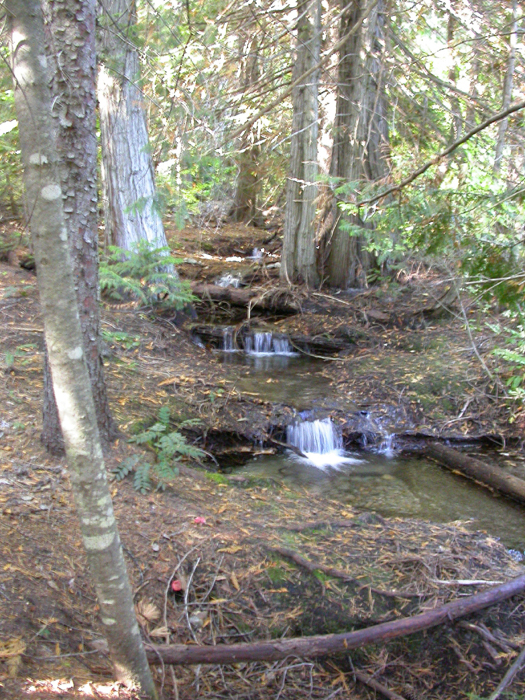 As you might guess from the name, the river has hot springs running into it. We took a swim in it but did not take the camera. 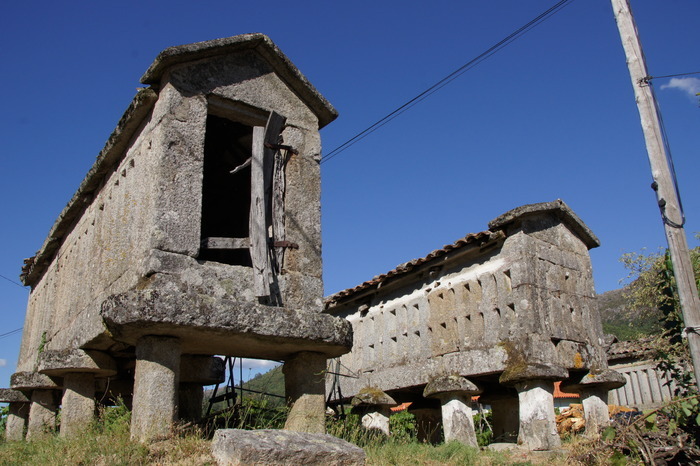 We saw many of these structures in rural Portugal. They varied a bit in structure, but were all raised off the ground and all had some gaps in the sides. One of them had a number, which may have been a year (1891), inscribed over the door. And yeah, that would be the year it was made. 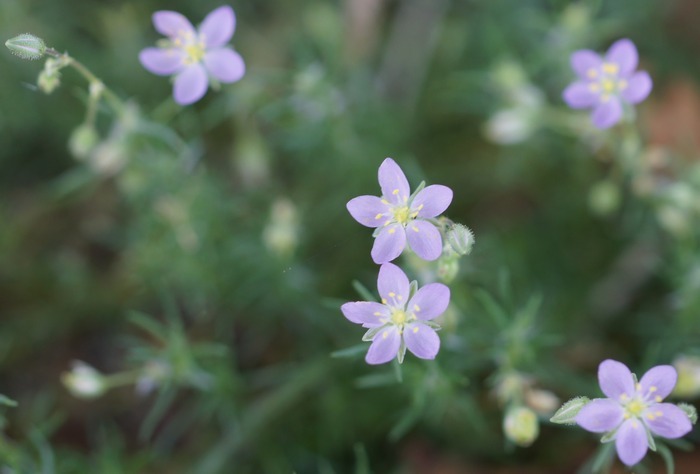 Another unidentified wildflower. These were tiny, about 2mm across. 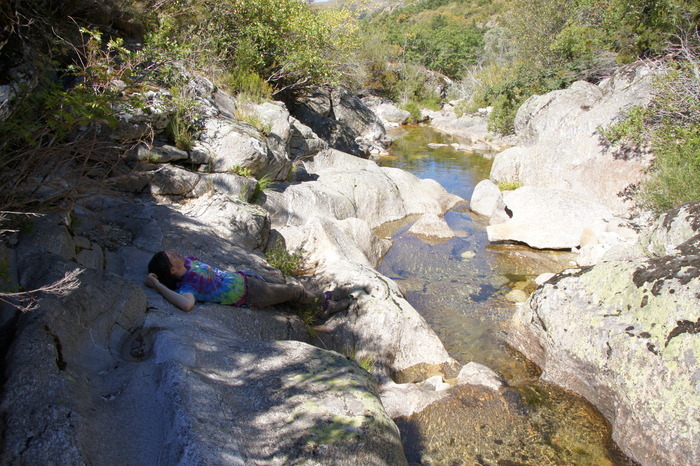 We intended to spend our next night in the Parque Natural de Montesinho. We elected to drive up the road that lead to Spain, and stop somewhere along the way. At least along this road, though, it seems to be more of a national field than a national forest. There are a few trees, but they are small and recently planted. So we continued North. We noticed as we got closer to the Spanish border that there was a tiny gap in the road on the map. As we drew up to the border, the roads got narrower and narrower, finally turning into a cobblestone alley barely big enough to squeeze the car through. 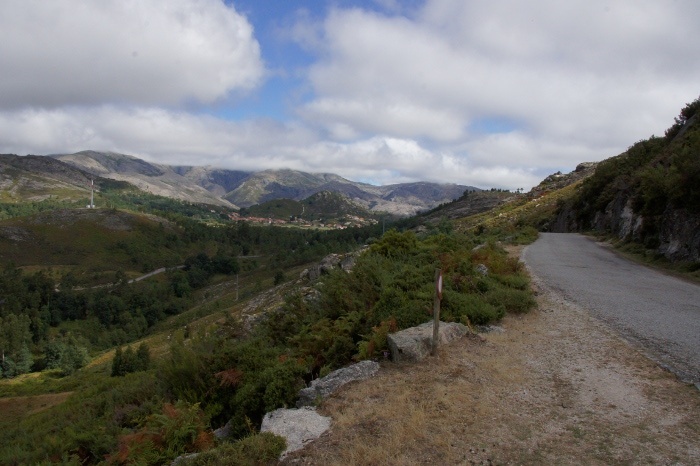 Then there was a sign for Spain, the road widened again, and we were back on our way. My best guess is that this border crossing didn't officially exist before the EU, but the strange contrivances of government were not going to stop the people of this town which happened to be split by the border from going about their everyday lives. 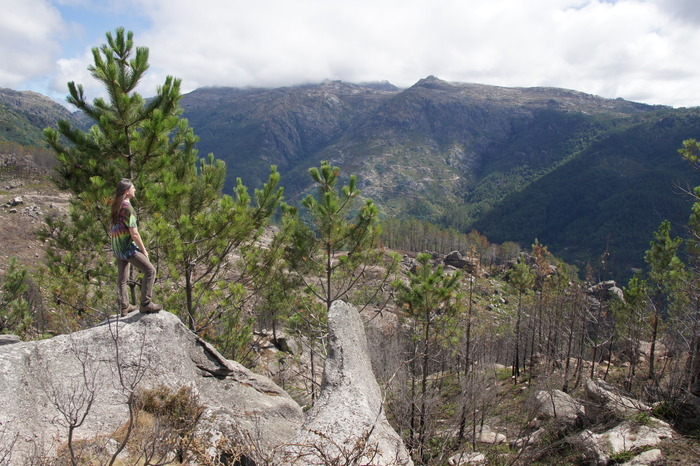 We ended up here, in the mountains near Porto (not the big Portuguese city, but the tiny Spanish mountain town). When I see macrolichens, I know I'm in the right place. We knew there was a hotel in town, what we did not know is that there was only one hotel and it was festival night. We found the hotel and asked for a room. The lady said something in Spanish. We got out our Spanish-English dictionary and gave her our best Spanial looks (that look which says, I'm kinda dumb but nice ). She got on the phone and made about 10 calls, walked to the back room and back to the front room, had a long conversation with someone in Spanish, and finally said, Yes . We could hear the festival quite clearly from our room, especially the Bon Jovi cover band, but it was warm and dry and had a shower. 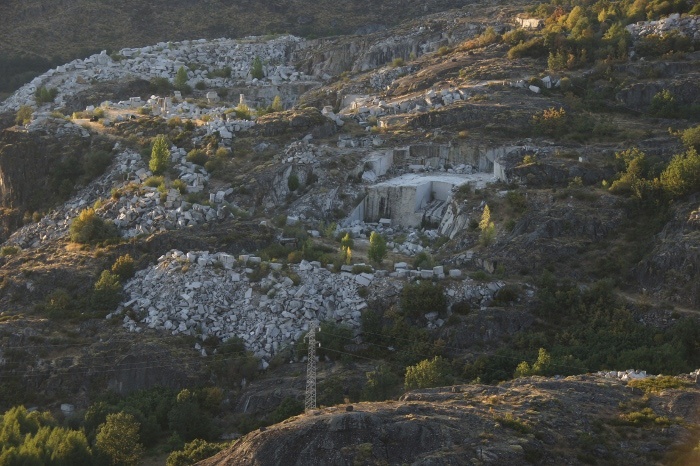 I'm sure the locals don't find this quarry to be picturesque, but the big blocks of white stone looked pretty neat. 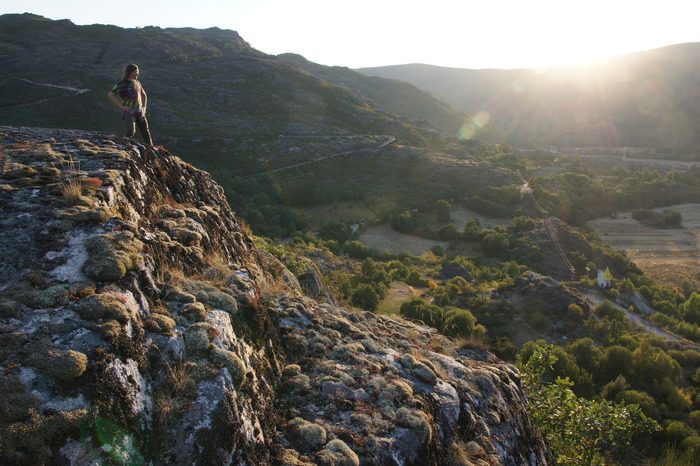 We took the road from Porto into the Lago de Sanabria park. We'd already had breakfast, but this would have been a very nice picnic area. This park also had fountains. Many of our friends were spending this weekend at Burning Man, a big event in the Nevada desert which takes place on a dry lake bed called the playa . Playa is also the Spanish word for beach, so there were lots of playas around. This was one of them, although it was more of a marsh going into the lake than a swimming beach. 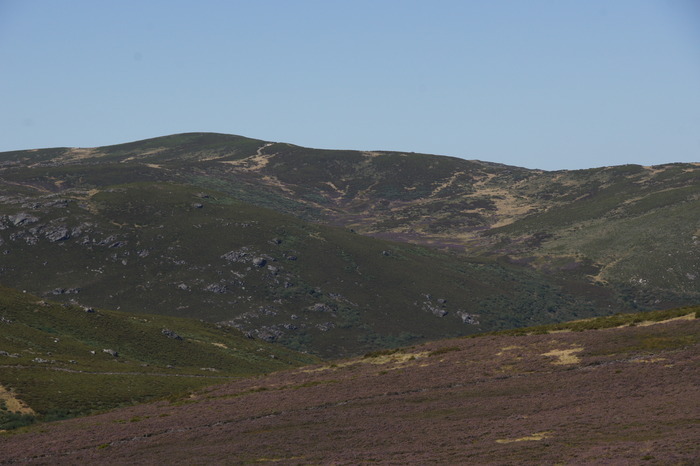 Heather forming pools of purple in the sheltered places between the mountaintops. Some Spanish cows, much like the ones at the Rainbow. The ones at the Rainbow seemed to have slightly bigger horns, and I only saw cows - no bulls or steers. In Spanish, Porto means bridge. 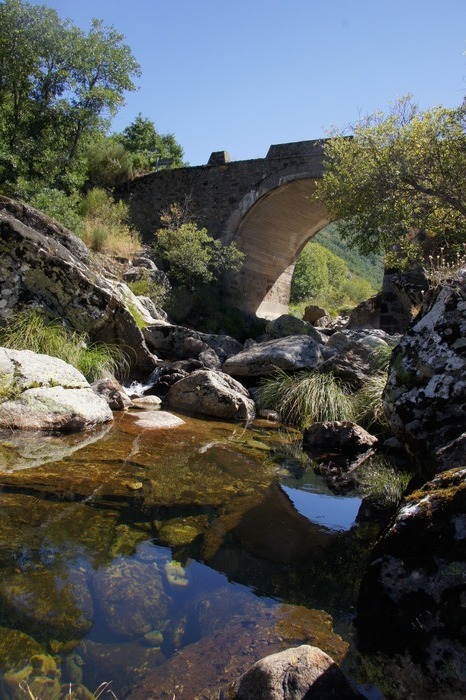 It seems like a small bridge to justify a name, but it is an incredibly beautiful little river. The water is as clear as glass, but still has plenty of fish and other life. Another lizard, this one with a Spanish accent. 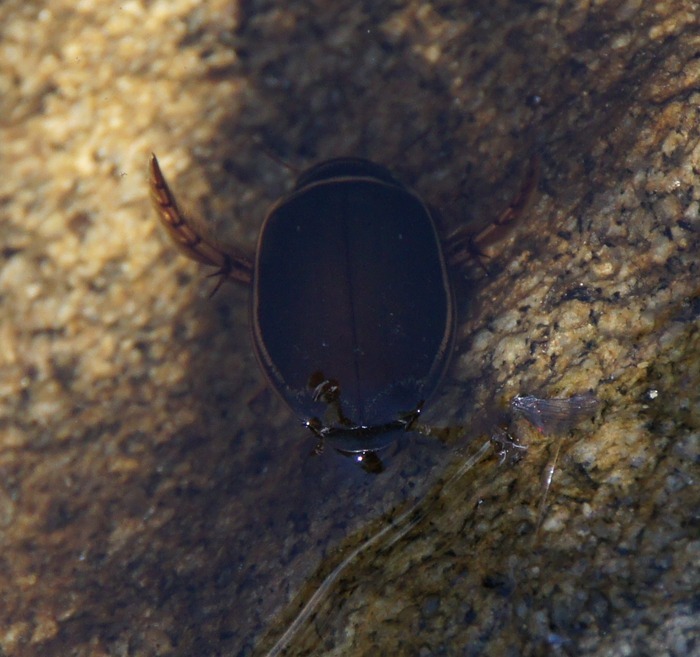 This is some kind of water bug, about 2cm long. 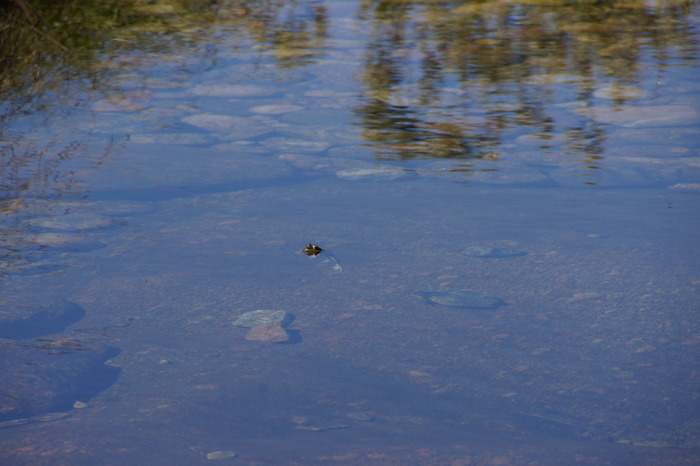 A frog in the clear water. 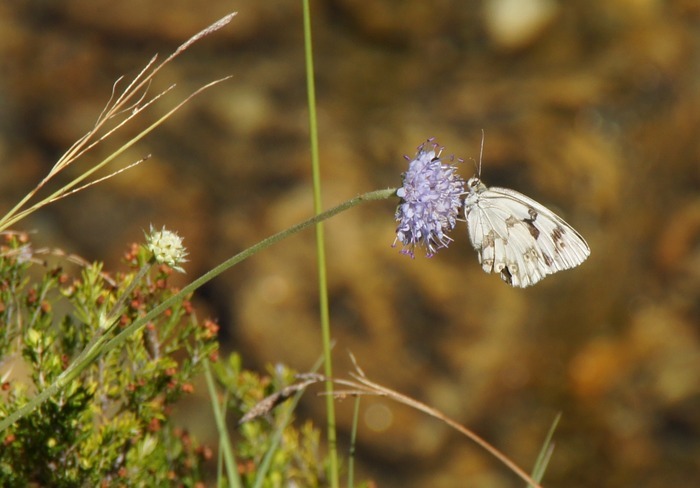 A butterfly on a wild onion. Eric enjoying the smooth rocks and cool air by the river. 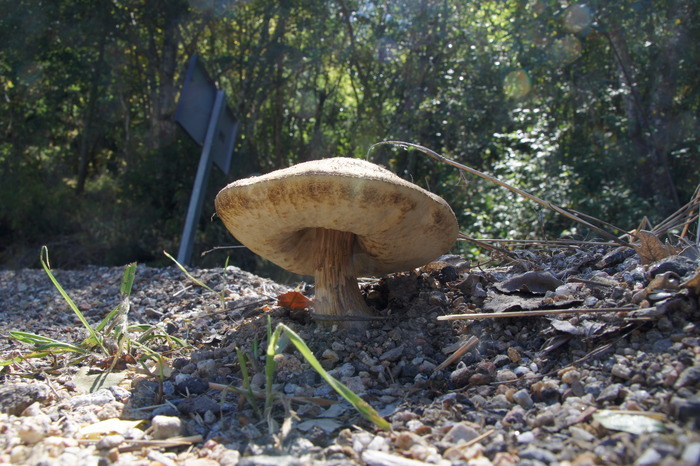 Aside from one Russula at the Rainbow and a few polypores, this was the only mushroom I spotted on the trip.